Emergency medical services and its personnel is can be commonly identified with the star of life symbol. 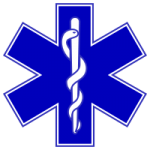 The star of life with its blue six pointed star that features at the center the Rod of Asclepius, the ancient symbol for medicine and healing, was originally designed by the NHTSA. Ambulances, equipments, crews, medical personnel, elevators, and medical merchandise use the symbol. The star of life was designed by Leo Schwartz, the NHTSA EMS branch chief, when the Red Cross complained the use of Omaha orange cross which resembles their logo. The new symbol came from the Medical Identification Symbol of the American Medical Association and was registered in 1977 for the NHTSA and later given to NREMT to be used as the EMT logo. The six bars on the star of life represents the EMS function which include detection, reporting, response, on scene care, care in transit, and transfer to definitive care. Detection means the first on the scene which are usually civilians and other involved. Reporting calls for help and emergency medical dispatch. Response provides first aid and immediate care by rescuers. EMS personnel provides on scene care after the arrive on the scene. The EMS personnel provide care in transit as they transfer the patient to definitive care to a hospital. The snake on staff at the center represents Asclepius, son of Apollo in Greek mythology, who learned the art of healing from the centaur Cheron. Zues, king of the gods, became worried that the humans will become immortal and sent a thunderbolt to put an end to him. Later, people worshipped Asclepius as a god and eventually Zues brought him back to life making him a god. The staff that Asclepius hold with a snake coiled around it became the symbol of medicine. For further reading you can check this Wikipedia page and this other page.